Officials say winds coming from the north are pushing smoke from wildfires in Canada into parts of Washington. If you are viewing this story in the KING 5 app, click here. The Washington Department of Ecology is warning Washington residents of smoke. Officials say winds coming from the north are pushing smoke from about 150 wildfires in Canada into Washington. 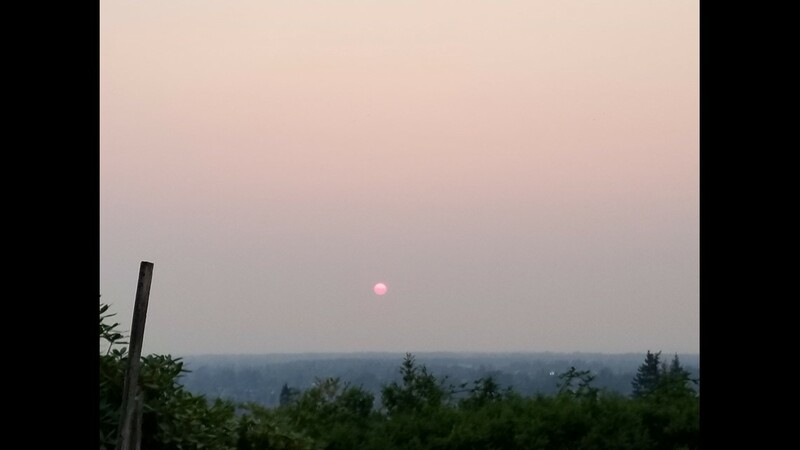 Currently, air quality in the state is "among the worst in the country," according to Dr. Ranil Dhammapala with the Washington Department of Ecology. The agency has issued a Stage 1 air quality burn ban for the above counties. The burn ban is in effect until conditions improve. "Unfortunately it means we have to limit our outdoor actives, even healthy people shouldn't be spending prolonged amount of time outdoors," said Ranil Dhammapala with the Department of Ecology. "This weather pattern we’re locked in it. It's going to keep the BC smoke flowing. We will need a good southwest wind to clean it out and that's not forecast until at least not on the immediate horizon not until early next week." Chelan County Emergency Management is offering masks for residents impacted by the smoke. Washington's Air Monitoring Network grades air quality and expects it to vary between 'moderate' and 'unhealthy' for the next few days. The haze is also impacting air traffic at Sea-Tac International Airport. Officials advise travelers to check with airlines about specific flight delays before heading to the airport. In the northern Whatcom County town of Lynden, the grey skies left it looking a lot more like L.A.
"You can already smell it in the clothes and we've only been out for about an hour," said Bill Keep. Keep should know about smoggy skies. He's visiting Lynden from the Los Angeles suburbs. "It sure looks like L.A. with these hazy cloud that aren't actually clouds," he said. "Lost a little bit of my voice. I'm a little cloggy in the nose." Officials at the Northwest Clean Air Agency have issued an "unhealthy air" warning for the towns of Kendall and Maple Falls in eastern Whatcom County. At this point, however, the situation isn't bad enough to prompt widespread warnings to stay inside. Adding to the issue are smaller wildfires burning in the Chuckanut Mountains in southern Whatcom County and also near Darrington (Snohomish County). "I got up this morning and expected the sun to come out. It was a red, orange ball, hardly visible. It's kind of scary. Eerie," said Lynne Heeringa of Lynden. By the time the clock struck noon Wednesday it was already 87 degrees in Lynden. With no end in sight, many are seeking escape elsewhere. Duane Hansen left Lynden for the Bellingham waterfront where breezes off the bay cooled him down, although smoke obscured much of the mountains and hillsides around him. Like everyone, he hopes this whole thing will blow soon over. "It's kind of all around us," he said. "That's not good." Central Washington. Photo: Steve Jespersen. Gig Harbor Peninsula from Titlow Beach in Tacoma. Photo: ksherman22. Silver Lake. Photo: Marissa Heitman. Eric Wilkinson, Kelsey Caulfield, Jenna Hanchard and Jennifer Van Burkleo contributed to this report.